Just about this time of year, brightly colored boxes of Amaryllis bulbs appear in the stores here. If I plant one now in a pot indoors, this pretty tropical flower will bloom in time for Christmas. 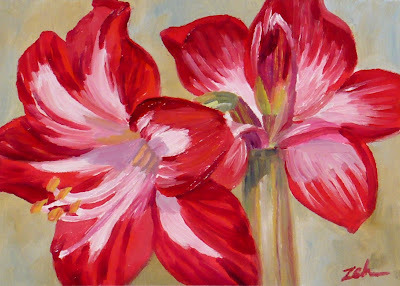 The red and white Amaryllis in this painting, though, was blooming in the park in Hamilton, Bermuda when I was there in the spring. This painting has been sold. See more of my art on my website: zehoriginalart.com. Thanks for your visit today!